The following article was authored by Bridget Balch and originally published in the Houston Chronicle. Two mature bald eagles have lived in the area near Lake Woodlands since 2000, nest hopping at least five times since settling in the area. Their current nest, which they've kept for the past four years, is located in a tree right next to Lake Front Circle, not far from The Woodlands United Methodist Church. Over the past few months, the couple has been busy caring for their youngest eaglet, a small black-feathered baby bird that hatched in January and will likely learn to fly by next month. Another pair of bald eagles also nests in The Woodlands, near the Bear Branch Reservoir. Together, the two couples have hatched 36 eaglets since 2000, serving as shining examples of how the bald eagle population has rebounded over the past few decades from hovering on extinction to thriving. 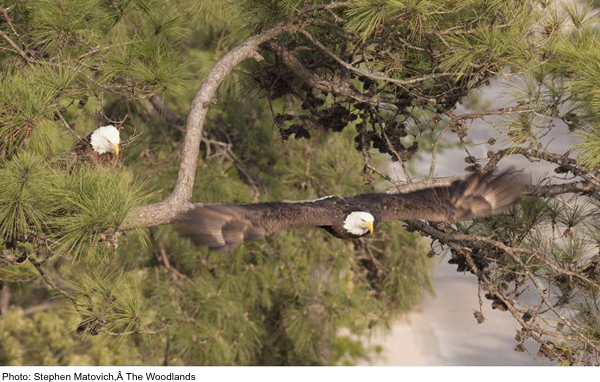 "They're popping up everywhere all over the country," said Fred LeBlanc, environmental manager for The Woodlands Development Co., which owns the land surrounding the Hughes Landing eagles' nest and has a permit with the U.S. Fish and Wildlife Service outlining conditions for development near the birds' nesting area. The nation's symbol had dwindled to less than 500 nesting pairs in 1963 after widespread pesticide contamination of fish, the birds' preferred prey, killed off a large portion of the population, according to the FWS. The bald eagle was placed on the endangered species list in the 1960s and, since then, has climbed back up to a healthy number. It was removed from the list in 2007, but is still protected under the Migratory Bird Treaty Act and the Bald and Golden Eagle Protection Act. Click here to read the article in its entirety on Houston Chronicle.